Gen. Wm. 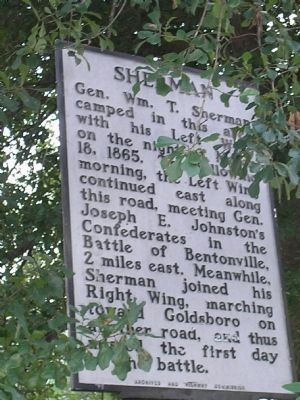 T. Sherman camped in this area with his Left Wing on the night of March 18, 1865. 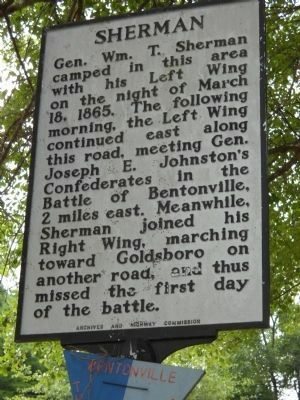 The following morning, the Left Wing continued east along this road, meeting Gen. Joseph E. Johnston’s Confederates in the Battle of Bentonville, 2 miles east. 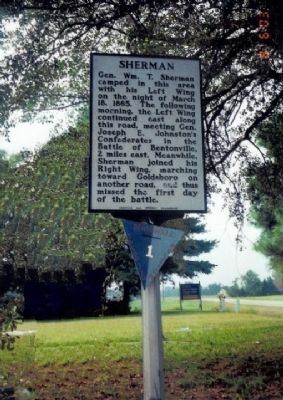 Meanwhile, Sherman joined his Right Wing, marching toward Goldsboro on another road, and thus missed the first day of the battle. Location. 35° 16.927′ N, 78° 21.499′ W. Marker is near Bentonville, North Carolina, in Johnston County. Marker is at the intersection of U.S. 701 and Harper House Road (County Route 1008), on the left when traveling south on U.S. 701. Touch for map. Marker is located at the southeast corner of the intersection of US 701 and Harper House Road. Marker is in this post office area: Newton Grove NC 28366, United States of America. Touch for directions. (approx. 2.4 miles away); Confederate Hospital (approx. 2.4 miles away); Federal Earthworks (approx. 2.4 miles away); a different marker also named Battle of Bentonville (approx. 2.4 miles away); Union Headquarters (approx. 2.4 miles away); Bentonville Battlefield (approx. 2.4 miles away). Touch for a list and map of all markers in Bentonville. 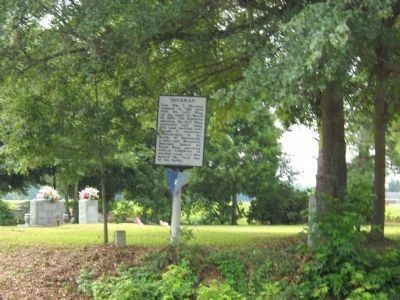 This is marker # 1 along the Bentonville Battlefield Driving Tour. 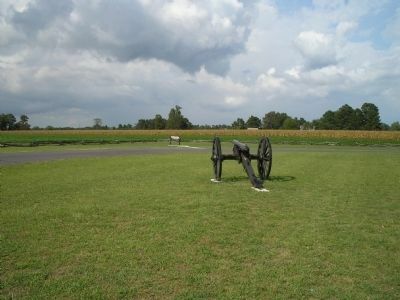 On this ground, Sherman's Left Wing clashed with Johnston's Confederates on March 18, 1865, the day after they camped at the site of the marker. 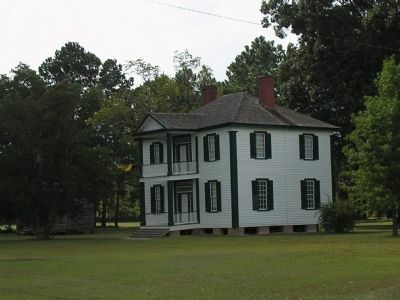 This house on the Betonville Battlefield was used as a Union headquarters and a field hospital during the battle. It is located about 2½ miles east of the marker. More. Search the internet for Sherman. Credits. This page was last revised on June 16, 2016. This page originally submitted on December 14, 2008, by Bill Coughlin of North Arlington, New Jersey. This page has been viewed 875 times since then and 8 times this year. Photos: 1. submitted on August 3, 2010, by Bill Coughlin of North Arlington, New Jersey. 2. submitted on December 14, 2008, by Bill Coughlin of North Arlington, New Jersey. 3. submitted on July 27, 2009, by Bill Coughlin of North Arlington, New Jersey. 4. submitted on August 3, 2010, by Bill Coughlin of North Arlington, New Jersey. 5, 6. submitted on December 14, 2008, by Bill Coughlin of North Arlington, New Jersey.